Meet Abbie & Jake. This couple is so sweet, from the first time we talked, to the hour turned two hour long Starbucks meetup, I knew they were a great pair! 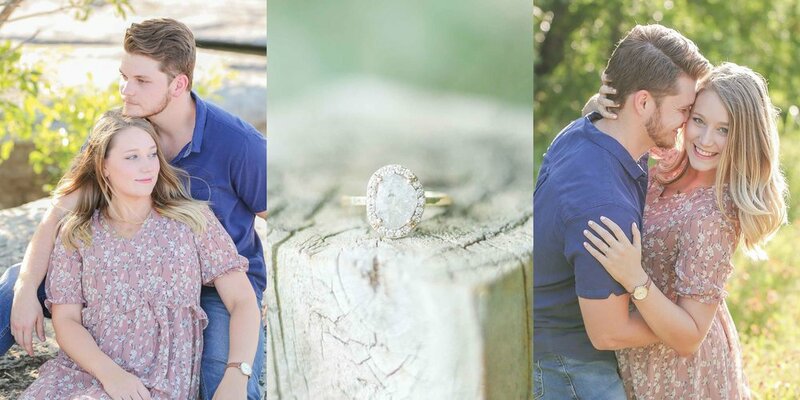 As they told me their love story, I couldn't help but feel as though we were old friends or family and they were just so excited to fill me in on the details of what brought them together. Their love for one another is so obvious when you are around them and if I could describe their love in two words, from what I have seen so far, I would say JOYFUL & GENUINE. Abbie & Jake just have a genuine air about them that is full of joy, which is hard to describe unless you are blessed to get to know these two in person. 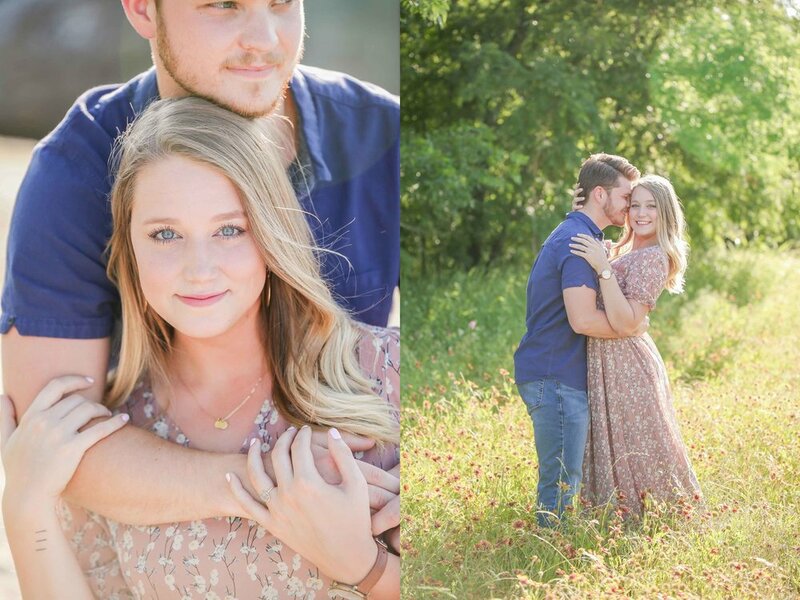 They are both beginning their nursing careers and as they explained the details about their future plans, it made me automatically want to cheer them on in a best friend or family kind of way. They are hard working, caring, goal oriented and also, their relationship is Christ centered. These are my kind of people. They genuinely love each other and they love others as well. I'm telling you, the cream of the crop type of couple! Q: Abbie, how did you meet Jake ? Jake and I met at a college football game that took place only two weeks into my freshman year of college. So to say I didn't know school without Jake would be perfectly correct. Jake so lovingly encouraged one of my friends to invite me to a party he was hosting at his house. I was reluctant at first because I had just come home from a date (haha!) but I obliged and made my way to the party. (Side note: If you don't know me, I go to bed really early most days.. this will show its necessity in a few lines). At the party, he offered me coffee and we began to chat. We hit it off immediately and talked the entire night about everything under the sun as if no one else at the party was even there. At 5 am, we got donuts and we made plans to hang out again after a couple hours of sleep. Fast forward a couple of days, weeks, who knows (; and he kissed me to my favorite song playing in the credits of my favorite movie. 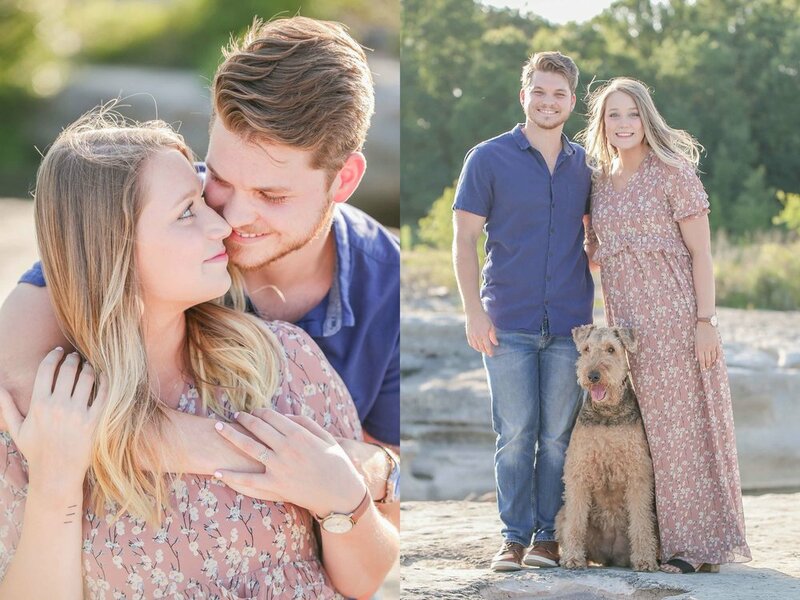 Now, we are happily engaged, have a sweet pup, and are both starting our careers as nurses. Q: Abbie, how did Jake Propose? "Jake had told me a couple of days before that he wanted to have date night on Friday (which is pretty typical in our relationship) so I didn't really think much of it. Jake and I were both in nursing school at the time and he was going through the toughest semester of the program at the time. He had 2 clinical rotations, a couple of assignments and an exam or something along those lines going on the same week. Needless to say I was not expecting a ring! We had discussed engagement and marriage but I was convinced that he would probably decide to wait until winter break or after. He texted me that he had gotten out of his clinical early ( he actually explained his plan and asked his professors if he could leave early and have an extension on his assignments!) and that he was ready to go to dinner. ( side note: the restaurant that we had chosen to eat at is my favorite! Its very casual though.) He asked me what I was wearing to dinner and my response was athletic shorts. (Ha! Thank you to my roommate, cousin and MOH for convincing me to throw on a casual dress). He picked me up, looking quite handsome and we went to dinner. Throughout the meal, Jake was acting kind of weird but I just went along with it. After we get done eating, we get back in the car and he asks me to put on a blindfold! (I thought nothing of this at the time, looking back it should have been a clue (; ) and we went for a short drive to the place we frequently have dates and have gone to throughout the entirety of our relationship - a cliff overlooking the lake. We got out of the car and as he was leading me to the edge of the water and I heard camera clicks. That's when I knew! He removed my blindfold and asked me to marry him with the sweetest words. I bawled and shook my head yes. He put the ring on my finger and looks up at me and says "you have to actually say yes!" It seemed so perfect that it felt like a dream. Afterward we celebrated with all of our friends and it was a blast. best day ever." When we first met up in person at Starbucks as we were sipping our drinks, Jake explained that he fell in love with Abbie even more when he first took her to his parent's house. He explained the drive was pretty long and a bit out of the way, but Abbie was up for the adventure & when they arrived, Jake explained the way Abbie interacted with his family and specifically with his little sister just felt like it was meant to be. They both didn't know at the time, but God had a way of bringing these two together in a way that only happens by design. It sure was meant to be and Abbie will soon be a part of the family, just where she belongs. 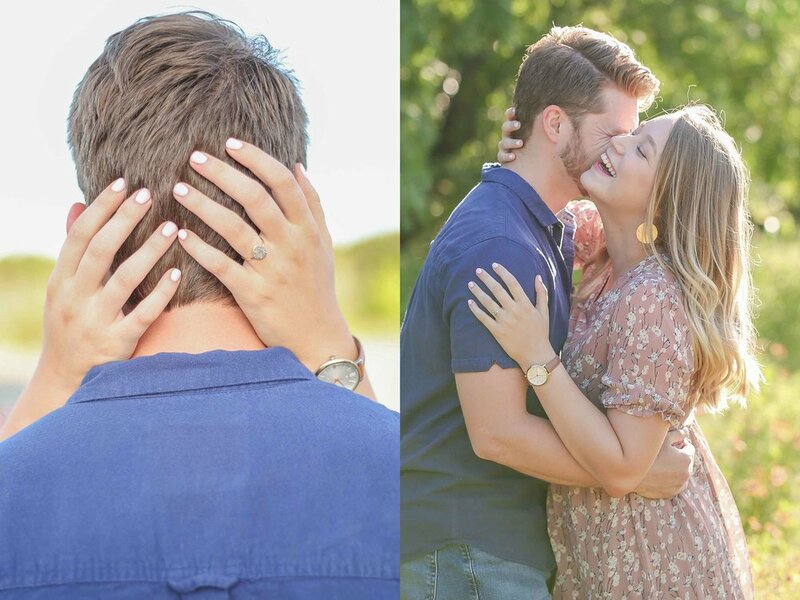 It makes me so happy to follow these two lovebirds during their Engagement! They explained they really wanted to have an 'at-home' photo session at their soon-to-be new apartment in Temple, which is where they will be working & living & I'm on board for the adventure too. So, stay tuned for their next indoor session in the next few months. Okay, I almost forgot to mention how amazing their sweet 4 year old pup, Josie was on our session! This dog was so full of energy and so extremely happy to be in the park. She got a bit too excited at one point and actually decided to take a swim. I think she immediately regretted that decision based on how scared she looked, but Jake came to the rescue and helped Josie climb out of the water. We all began laughing as Josie began shaking to get the water off of her while simultaneously spraying each of us with the river water. We had a great time on our session & I cannot wait for our next session together & especially for the big day! I had such a great time together on our session & I am sincerely looking forward to being able to have y'alls at-home session soon! Don't forget to de-stress during all the crazy wedding planning. Make take time for each other during this special chapter of your lives together just before you tie the knot. I know planning a wedding can seem overwhelming at times, but don't forget to laugh at the small things and enjoy each moment you have together just like y'all did on our session together. Y'all are going to make an amazing legacy of love for years to come, so be patient with one another and remember what an amazing thing only you have between the two of you! I will try not to tear up during your ceremony, but I can't promise anything!